Also known as The Bridal, The Heel And Toe, Jenny Lind’s, Jenny Lind’s Favorite, Jenny Lind’s Favorite Serenading, Jenny Lind’s Favourite, Jenny Lind’s Favourite Serenading, The Jenny Lind, Jenny Ling, Jenny Linn, Johnny And His Camera, Quinn’s Irish. Jenny Lind has been added to 15 tune sets. Jenny Lind has been added to 111 tunebooks. i came across the original version of this from a mid-Western USA source for chemnitzer concertina. Jenny Lind was originally a three parter but the third part is naff and it works much better as a two parter. TRhere is a suggestion that the tune may have been written in america (as Jenny lind "The Swedish nightingale" did tour the music halls in the States but its likely to have been composed in England. its most certainly not Irish an it does work well as a Southern English polka or even as a northumbrian Rant. I ave been to Jenny Linds country retrat in the malverns. She had a pair of quite oridnary English farm cottages rerrofed in the steep swedish style and had an an industrial strength Victorian heating system installed. The cellars are very hot and make an ideal breeding site for the rare lesser Horsesho Bat - hence my visit. Angels of the North link Jenny Lind with Dark Girl dressed in Blue and La Russe for La Russe and similar dances. # Posted by Noel Jackson 13 years ago . I think Mary Custy recorded a very similar tune with Sharon Shannon. Versions usually played at English sessions are much less ornamented, and I have never come across this B Part. There is a Shetland polka which is nearly the same as the trad English one. # Posted by tradplayer 13 years ago . I used to play the Shetland one but lost the sheetmusic years ago, and the name with it. Did it have a different name? Can you put it in abc? "In September 1850, P. T. Barnum ( YES! ~ that Phineas Taylor Barnum of ‘Barnum and Bailey Circus’ fame, famous and infamous 19th Century showman, promoter and circus man) embarked on a nationwide tour with a Swedish opera singer that would bring him a vast fortune and create a new cultural phenomenon: the celebrity. Barnum succeeded in building such great public anticipation about the "Swedish Nightingale" that 40,000 people showed up to greet the arrival of her ship in New York harbor. From her opening concert in New York Citys Castle Garden to subsequent performances in cities and towns across the country, Barnum fueled public fascination with Lind by orchestrating events and negotiating Lind-endorsed products (including Jenny Lind songs, clothes, chairs, and pianos). "Lindomania" lasted until 1852, when the partnership collapsed over logistical and financial issues. Barnum shrewdly promoted Lind’s character—her modesty, benevolence, and selflessness—as much as her artistry. One scholar contends that because of Barnum’s promotion, Lind became "the standard for measuring not just sopranos, or even women artists, but women" throughout the 1850s." & food ~ "Jenny Lind Soup"
"The first reference to the Jenny Lind "Polka" is in a collection of "popular" tunes for cornet orchestras, published in 1846. However, in this collection, the composer of the tune was not listed. A dance was later composed to fit the tune, and was published by inventor Elias Howe in 1858, as part of a ball room dance book. Its possible that the "reel" version also comes from this time period. ~ "
I think the Shetland variant that people have mentioned is "Da Boannie Polka"
Thanks Nigel. I took the liberty of posting that here https://thesession.org/tunes/5559. my grandad (a fiddle player) always sang johny and his camera,camera,camera to this tune! Up jumped johnny with his camera,camera,camera!He was born 1918 and went to school with Jimmy Power the fiddler. He had lots of words to remember tunes, some of them bawdy! # Posted by southeast fiddler 9 years ago . "This polka was written in the 1840s, and is believed to be the tune used by New York dancing master Alan Dodsworth in 1844 when he introduced the polka to America. Today, only the first two parts of this tune usually are played, and it is often used for the "Heel & Toe" polka, which we danced to as kids. Vivian plays the original four part version, backed up by Phil Williams, guitar. Video by Shirley Calvert at the District 9, Washington Old Time Fiddlers Show, Chehalis, WA, September, 2006." from Syracuse, New York, U.S.A. 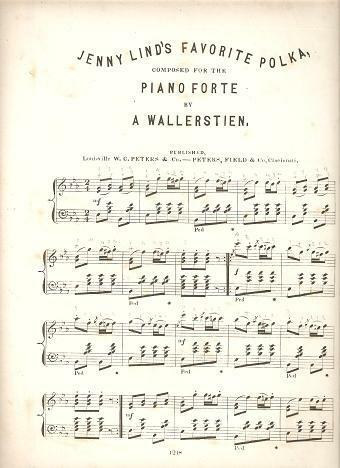 The tune is attributed to Anton Wallerstein of Germany. It seems that it may have been composed for Jenny Lind’s tour of the US. See the publishers misspelled his name too! Submitted on December 27th 2011 by ceolachan. Clearly related, but different enough to survive on its own? Apparently, the publication date is 1840 - most sources date it later. I’d meant to return here ages ago and to add more information on the quadrille and the music, from a publication on a set of the quadrilles for ‘Jenny Lind’ and a date in the 1800s… I’ll keep looking and will try to remember to add it, and an Irish set dance take on the figures for comparison. born 1813, died March 26th, 1892, age 78, was a German violinist and composer of dance music, writing 275 works (Grove’s: 1945). Published by Oliver Ditson - sometime in the1840s? 22.) Jenny Lind Polka - This tune was written by German composer Anton Wallerstein in the 1840’s and was named after Jenny Lind, the popular soprano who was known as the "Swedish Nightingale." It was popularized by Allan Dodsworth, a dancing master who brought the polka from Europe to America. It’s often known in America as "Heel and Toe Polka, and if you use this for that dance, the music will fit the dance better if you don’t repeat the parts. For a regular polka, play it however you want to. There are actually two more parts to the tune – one of these days I’m going to learn them! Just learning the last track off the Slan Le Loch Eirne CD and after looking here have become a bit confused. Quinn/Hastings play The Heel and Toe as Gian Marco posted it here: https://thesession.org/tunes/4467. The B parts of that tune and Jenny Lind’s are nearly identical. Quinn/Hastings then follow the first tune with Devlin’s which appears to be this: https://thesession.org/tunes/5559. Consequently, that tune shares the A part with Jenny Lind’s. So, basically they play one tune that has the A part of Jenny Lind’s and a second tune that has the B part of Jenny Lind’s, but they never actually play Jenny Lind’s. Am I missing something here or is this just another case of the tradition doing its thing? # Posted by Jason G 7 years ago . This polka appears in the Larry Smyth MS c.1880s-1920 under the title of the "Bridal Polka". Smyth was from Abbeylara, Co Longford. The only other version of it with this title is found in Ceol Rince na hEireann Vol. 5 (1999). The source is accredited to a Thomas McGuire MS from the late 1800s. McGuire was from Lisduff, Co. Cavan. Interestingly its the exact same version as that of Smyths! So either its a case that both McGuire and Smyth had the exact same tune, note for note, or else the book has referenced the McGuire MS by mistake. I’ll need to check that manuscript to verify it. Smyth also has another version of the tune entitled as "Jenny Lind". # Posted by ConorW 5 years ago . More Longford connections to the tune - Frank Quinn (1893-1964) of Greagh, Drumlish, Co. Longford recorded the first two parts of this tune in the key of D on the accordion in February, 1923 under the title "Quinn’s Irish Polka". I also just found a three part version of the tune in the key of G entitled "Jenny Lind Polka" in the Patrick O’Farrell MS of Aughadowry, Ballinamuck, Co. Longford written around the 1860s-70s. All of the Longford versions mentioned (except "The Bridal Polka") correspond very closely to one another which is not surprising given the geographical proximity of the musicians to one another and also the fact that they were all connected to the fiddle master Thomas ‘Blind’ Kiernan (c.1807-1887) of Cartron, Drumlish, Co. Longford. I got this version from a recording of my great-grandfather, who hailed from Ballydesmond and learned the fiddle from Tom Billy. He plays it after what is now known as Dennis Murphy’s, and ends with the Rakes of Mallow. I like the set as I am not a particular fan of any of the listed polkas, but they come together nicely. If you’re a fiddler, go wild with the drones, it helps!